After a little over 3 years, one 30 day blog challenge, 2 brain surgeries, 1 adrenalectomy, countless hospitalizations, and 120 pounds lost, I have finally posted 100 blog entries. When I started this blog, I kept it just for my record, as a way to vent. I was horrible at keeping journals but wanted to keep some kind of record of events. At first, it was so my family and friends would have some idea of how I was feeling if I died before I got help. It turned into a way to keep my friends and family informed of the progress I was making, and finally, a way to help others going through health crises. 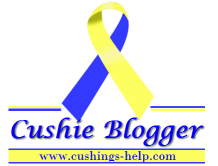 I love going back and reading about the day I was finally diagnosed, or after I first lost weight after a surgery, or the 30 posts I wrote for the Cushing's Awareness Challenge last year. It has been a less than awesome journey, but I have learned more that I ever could have in a text book in medical school, and most importantly, this entire experience has made me a stronger person, because it was my only choice to become one. I have learned that being strong doesn't mean not crying about things that upset you, or not complaining when you end up in the hospital for the 3rd time in 3 months, but not giving up when it seems that your body is going to give up on you no matter what, to fight for a diagnoses and treatment, and to make it through this when it seemed like there was never an end in sight. I never could have made it through everything in the last 3 years without the support of my friends and family. I know this isn't the end of hard times, just a milestone for me and a chance to reflect. I have a lot to get through in the next few months, including another surgery, and possibly a huge new diagnosis. Thank you so much for reading over the last few years. It was all worth it if I helped just one person through their journey with Cushing's Disease.